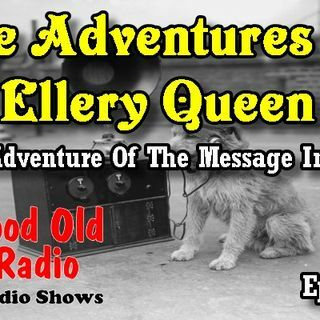 Today we feature The Adventures Of Ellery Queen: The Adventure Of The Message. appeared on different networks, with the first one broadcast on CBS June 18, ... See More 1939, and the last on ABC May 27, 1948.
programs scripts, and Zachary handled production. Beginning in 1945, Anthony Boucher replaced Dannay and worked with Lee writing scripts. During the programs first season, Radio Guide magazine called it a CBS drama that will keep you on the edge of your chair. It added You will find Ellery Queen both brave and brilliant and you will find yourself participating joyously in the ageless thrill of the manhunt.